For other uses, see Hitchin (disambiguation). Hitchin (/ˈhɪtʃɪn/) is a market town in the North Hertfordshire District in Hertfordshire, England, with an estimated population of 33,350. Hitchin is first noted as the central place of the Hicce people, a tribe holding 300 hides of land as mentioned in a 7th-century document, the Tribal Hidage. Hicce, or Hicca may mean the people of the horse. The tribal name is Old English and derives from the Middle Anglian people. It has been suggested that Hitchin was the location of 'Clofeshoh', the place chosen in 673 by Theodore of Tarsus the Archbishop of Canterbury during the Synod of Hertford, the first meeting of representatives of the fledgling Christian churches of Anglo-Saxon England, to hold annual synods of the churches as Theodore attempted to consolidate and centralise Christianity in England. By 1086 Hitchin is described as a Royal Manor in Domesday Book: the feudal services of Avera and Inward, usually found in the eastern counties, especially Cambridgeshire and Hertfordshire, were due from the sokemen, but the manor of Hitchin was unique in levying Inward. Evidence has been found to suggest that the town was once provided with an earthen bank and ditch fortification, probably in the early tenth century but this did not last. The modern spelling 'Hitchin' first appears in 1618 in the "Hertfordshire Feet of Fines". Panel representing the foundational history of Hitchin mentioning: King Offa, the River Hiz and the Hicce tribe. Now on the front of Hitchin Library, it was on the Sainsburys on Brand Street until the supermarket relocated to the Bancroft area. The name of the town also is associated with the small river that runs through the town, most picturesquely in front of the east end of St. Mary's Church, the town's parish church. The river is noted on maps as the River Hiz. Contrary to how most people now pronounce the name, that is to say as spelt, the 'z' is an abbreviated character for a 'tch' sound in the Domesday Book, (as in the name of the town). It would have been pronounced 'River Hitch'. The Hicca Way is an eight-mile walking route along the River Hiz Valley, believed to have been used for trade between the Danes and English in the Anglo-Saxon age. It is also likely that Hitch Wood, which lies some half a dozen miles south of the town also derives its name from the Hicce tribe, who gave their name to Hitchin. Hitchin is notable for St. Mary's Church, which is remarkably large for a town of its size. The size of the church is evidence of how Hitchin prospered from the wool trade. It is the largest parish church in Hertfordshire. Most of the church dates from the 15th century, with its tower dating from around 1190. During the laying of a new floor in the church in 1911, foundations of a more ancient church building were found. In form, they appear to be a basilican church of a 7th-century type, with a later enlarged chancel and transepts, perhaps added in the 10th century. This makes the church older than the story (not recorded before the 15th century) that the church was founded by Offa, king of Mercia 757-796. The town flourished on the wool trade, and located near the Icknield Way and by the 17th century Hitchin was a staging post for coaches coming from London. By the middle of the 19th century the railway had arrived, and with it a new way of life for Hitchin. The corn exchange was built in the market place and within a short time Hitchin established itself as a major centre for grain trading. The latter half of the 20th century has also brought great changes in communication to Hitchin. Motorways have shortened the journey time and brought Luton, a few miles away on the M1, and the A1 (M) even closer. By the close of the 20th century, Hitchin had become a satellite dormitory town for London. Hitchin also developed a fairly strong Sikh community based around the Walsworth area. During the medieval period, both a priory (Newbigging, now known as The Biggin) and a friary (now known as Hitchin Priory) were established, both of which closed during Henry VIII's Dissolution of the Monasteries. They were never reformed, although The Biggin was for many years used as almshouses. The British Schools Museum in Hitchin is home to the world's only known complete Lancasterian Schoolroom, which was built in 1837 to teach boys by the Lancasterian method (peer tutoring). Girton College – a pioneer in women's education – was established on 16 October 1869 under the name of College for Women at Benslow House in Hitchin, which was considered to be a convenient distance from Cambridge and London. It was thought to be less 'risky' and less controversial to locate the college away from Cambridge in the beginning. The college moved to Cambridge a few years later and adopted its present name, Girton College. Hitchin is in the local government district of North Hertfordshire which was formed in 1974 by the amalgamation of rural and urban councils. There is now no town council in Hitchin. Residents elect 13 members to the North Hertfordshire District Council. There are five electoral wards in Hitchin: Bearton, Highbury, Oughton, Priory and Walsworth. It is within the Hitchin and Harpenden constituency for representation in the Parliament of the United Kingdom. In the 2017 general election, Bim Afolami of the Conservative Party was elected. Between 1983 and 1997 Hitchin was included in the North Hertfordshire constituency. Before that it was in the Hitchin constituency. Hitchin is within the East of England constituency of the European Parliament which currently elects 7 MEPs. Prior to 1999 and the adoption of proportional representation, Hitchin was in the Hertfordshire constituency. Hitchin railway station is on the Great Northern Line, to which the Cambridge Line connects just north of the station. There are direct connections to London, Stevenage, Peterborough, and Cambridge. Journeys to London and Cambridge both last approximately 30 minutes on the Express services. Stevenage is 5 minutes away and Peterborough is typically 45 minutes distance in journey-time. The A505, A600 and A602 roads intersect in Hitchin, which is about three miles (5 km) from the A1(M) motorway and about ten miles (16 km) from the M1 motorway. Hitchin is about 9 miles from Luton Airport with a direct bus service linking the two. There are several primary schools in Hitchin. Secondary education is provided at Hitchin Girls' School, Hitchin Boys' School and the Priory School. There is a campus of the North Hertfordshire College in Hitchin, and it is also the home of the Benslow Music Trust which provides music education for adults. Hitchin Museum and Art Gallery (about to open Summer 2017) has an extensive collection that tells the story of the town's social history and of the rural industries that contributed to its prosperity. The British Schools Museum is housed in original Edwardian and Victorian school buildings. In March 2013 a poll in The Times voted Hitchin the 9th best town in the UK in which to live. Hitchin hosts an annual Arts and Music Festival in July which in previous years included Rhythms of the World. Hitchin Festival includes picnics, concerts, theatre, ghost walks, art exhibitions, comedy club, talks, summer fetes and fireworks. Since 2014, Hitchin has hosted the yarn festival, organised and run by members of Hitchin Stitchin. Music plays a very big part all year round. Hitchin Folk Club is one of the longest running and most respected clubs in the country meeting at The Sun Hotel on Sunday evenings; Hitchin Light Orchestra, Hitchin Symphony Orchestra and Hitchin Chamber Orchestra give regular concerts often in St Mary's Church and Hitchin Band perform around the country in brass band championship competition as well as the home town. There are two small theatres - The Market Theatre, a professional theatre, with a year-round programme including; comedy plays, thrillers, historical shows, jazz nights and cocktail evenings. The Market Theatre is known for its annual Adult Panto (running Dec-May), which also tours nationally, and the Queen Mother Theatre, home of the town's Bancroft Players, Big Spirit Youth Theatre and occasional visiting companies as well as Hitchin Films in the Richard Whitmore Studio. Hitchin Market remains one of the largest in the area with general markets on Tuesday and Saturday, bric-a-brac and collectables on Fridays and a Sunday Car Boot; there are also monthly specialist markets - Local Produce & Crafts on the last Saturday of each month, Lifestyle on the second Saturday and occasional Art Markets. Hitchin Markets is also the venue for the annual Duck Race during Hitchin Festival. The town centre has a wealth of independent retailers in food and drink and fashion and the historic core is a place to find niche boutiques. Since 1995, Hitchin has benefitted from award-winning town centre management and in 2009 established one of Hertfordshire's first Business Improvement Districts. There are a number of organisations for young people, including air, army and sea cadets and various scouting groups. The main burial ground for the town is Hitchin Cemetery on St. John's Road. Top Field, the home ground of Hitchin Town F.C. Hitchin Rugby Club is a non-profit organisation whose mission is to participate in and promote the sport of rugby union at all age levels within the Hitchin area. This includes Mini/ Midi (U7-U12), Youth (U13-U17), Colts (U19), Seniors (19+), Vets (35+) and Ladies. Hitchin RFC has a 50+ year relationship with the town of Hitchin, having been founded in 1954. See the history section for more. Highlights have included playing at Twickenham in the final of the national Junior RFU Cup in 1993 and the establishment of the country's first Academy. Currently their membership stands at over 500 people, including active and associate members. They have a community development programme and a Mini & Junior Section. Hitchin RFC runs 4 adult men's teams, 1 adult women's team, and mini and youth rugby teams at all ages. Hitchin Town F.C. was established in 1865 and later reformed in 1928. It is one of only three clubs who competed in the first ever FA Cup and still do so now. The club is the biggest sporting entity in the town. Hitchin is also home to Blueharts Hockey Club, a leading club since 1946. It also houses Hitchin Cricket Club, which has been an important cricket club within the area since 1866. Hitchin has a local swimming club, Hitchin Swimming Club, which competes at local level, county and regional level. The Hitchin Nomads Cycling Club, which caters for many competitive and non-competitive cycling disciplines was formed in the town in 1931. It is affiliated to British Cycling, the Cyclists' Touring Club, Cycling time trials and local cycling associations. Notable former members include pre-eminent cycling travel writer Harold Briercliffe and Max Pendleton, father of Olympic gold-medallist and track cycling World Champion Victoria Pendleton. Formed in 2003 and known as FVS TRI until November 2009, Team Trisports is a Hitchin-based triathlon club. In addition to triathlon, the club is affiliated to England Athletics and British Cycling. Hitchin Running Club was formed in 2008 and is one of the most popular clubs in the town. They enjoy a large fan base and many local people of all abilities take part in the social activities. They are based at the rugby club and are a not for profit organisation. Ickleford is a village situated on the northern outskirts of Hitchin, and to the south is St Ippolyts, Charlton and Gosmore. 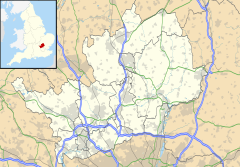 The nearest towns are Letchworth, Baldock, Stevenage and Luton. John Lloyd, co-founder of the international design consultancy Lloyd Northover. Second Lieutenant Frank Young VC, recipient of the Victoria Cross. Part of the 2010 BBC TV series Just William was filmed at the British Schools Museum. Scenes from the BBC drama series Doctor Foster were filmed in Hitchin, as well as the Channel 4 series Humans. In 1960 Hitchin Urban District Council was the first in Britain to introduce 'black bags' for refuse collection. Elizabeth the Queen Mother's birth in 1900 was registered at Hitchin, which is a few miles from her parent's English country house, St Paul's Walden Bury, where she spent much of her childhood. The 1951 book My Turn to Make the Tea by Monica Dickens is set in Hitchin (renamed Downingham in the book). ^ a b "North-Herts.gov.uk" (PDF). ^ Stenton, Sir Frank (1971). Anglo-Saxon England. Oxford University Press. pp. 43, 296. ISBN 0 19 821716 1. ^ Offer, Clifford (2002). In search of Clofesho – the case for Hitchin. Norwich: Tessa Publications. ISBN 095421210X. OCLC 49552770. ^ Hindley, The Anglo-Saxons - The beginnings of the English nation, 47. ^ Sir Henry Ellis (1833). A general introduction to Domesday Book: accompanied by indexes of the tenants in chief, and under tenants, at the time of the survey, as wall as of the holders of lands ... Volume 1. Commission on the Public Records. p. 263. ^ a b "Hitchin: Introduction and manors". A History of the County of Hertford. 3. 1912. pp. 3–12. Retrieved 15 September 2010. ^ Madgin, Hugh (2009). Hitchin Through Time. Britain & Ireland: Amberley Publishing. ISBN 1848687451. ^ "Councils and Politics". Hitchin Forum. Retrieved 25 February 2012. ^ Burge, Laura. "Hitchin Voted 9th Best Town In UK". The Comet 24. Archant Community Media Ltd. Retrieved 20 March 2013. ^ Burge, Laura. "Hitchin Festival to launch". The Comet 24. Archant Community Media Ltd. Retrieved 25 February 2012. ^ "Mary Angela "Mekitty" Dickens (1862 - 1948) - Find A Grave Memorial". ^ "Pam Rhodes". The Speakers Agency. Retrieved 10 September 2017. ^ "Second Lieutenant Frank Edward Young VC". www.bedfordregiment.org.uk. Retrieved 2 June 2013. ^ Judge, Ann. "The BBC 'Just William' at Hitchin British Schools". Herts Memories. Hertfordshire County Council. Retrieved 25 February 2012. Wikimedia Commons has media related to Hitchin. Wikivoyage has a travel guide for Hitchin. Historical Map of Hitchin Pubs, an interactive map of Hitchin public houses both current and closed. "Hitchin" . Encyclopædia Britannica (11th ed.). 1911.